Welding and Grinding areas where portability and/or longer screens are needed. Our welding screens are truly portable and ready to use in seconds. Screenflex welding walls arrive fully assembled and available for immediate use. These units are freestanding, with no overhead rails or frames required. Furthermore, when not in use, the accordion separators fold compactly and lock closed. 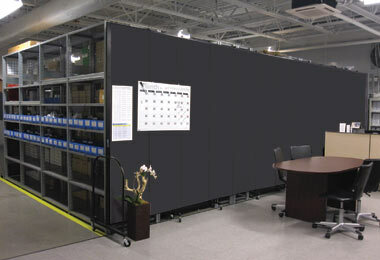 Each Screenflex welding curtains only need a two-by-three-foot storage area and fits through a standard doorway. The standard hands-free locking storage latch keeps the unit in the closed position for compact storage. Also standard on every unit is locking self-leveling, double steel casters. Self-leveling caster wheels ensure easy mobility and a stable unit. These standard features make rolling and storing your screen an easy task. 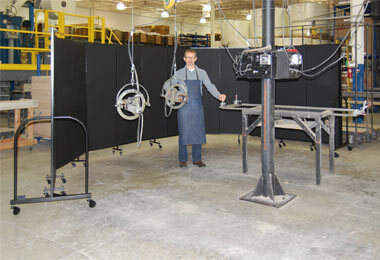 Just roll the screen to surround a welding area to create a temporary welding booth or a complete welding enclosure. The open space at the bottom of the welding screen allows for air flow and provides ample room for welding hoses and power cords. The Screenflex welding screen features steel panel frames and durable end frames. The unique hinge design allows you to arrange the welding partition in straight, angled, “L,” or “U” shapes. A full-length hinge secures all Screenflex welding screen panels together from top to bottom. This full-length hinge eliminates gaps and reduces the potential for flash burns and the glare of dangerous UV light. 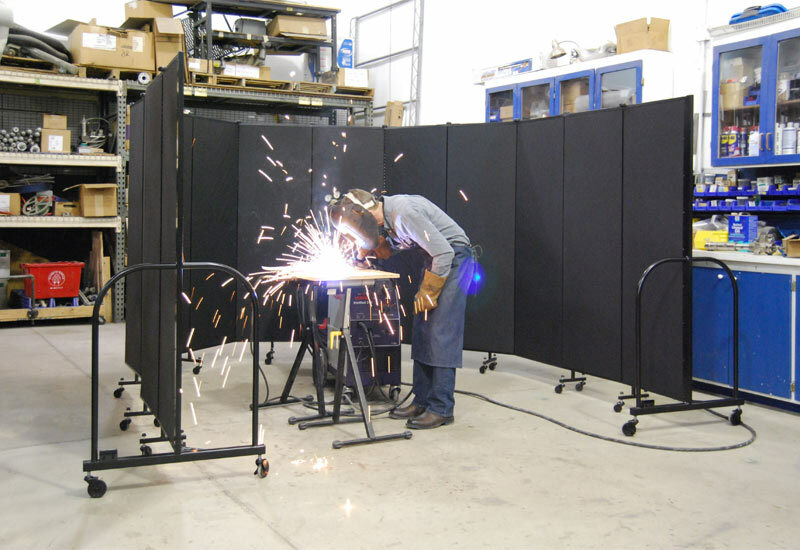 Required by OSHA, welding screens offer protection to other welders when welding is being performed in their vicinity. Hence, using a welding screen is an important step in creating a safe welding environment for yourself or your students. Our portable welding screens are available in 30 different height and length combinations. Consider adding an optional multi-unit connector to create longer lengths. So browse online or contact us to order a fire-barrier-fabric partition today!